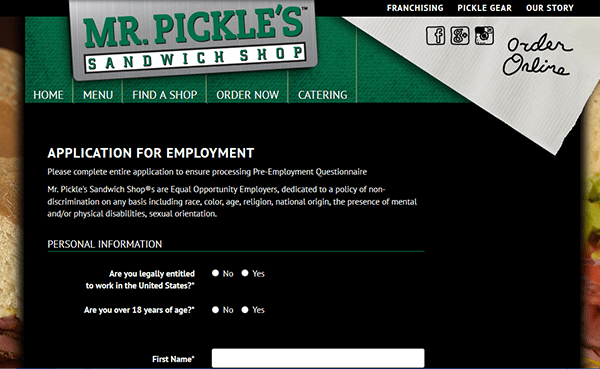 The Mr. Pickle’s Sandwich Shop job application can be found on the company’s main employment site. Use the links/buttons provided on this page to go directly to the company’s careers page. Once you’re on the careers page you will be able to search the list of current openings, create a job portal account, and submit applications for positions that you are interested in. The guide posted below provides a general overview of the company’s online application process. About the Company: Mr. Pickle’s Inc. got its start in 1974 in Daly City, California. The company currently has both corporate-owned and franchised locations. Use the instructions posted below to learn how to look for current openings and apply at a location in your area. Step 1 – Start by going to the Mr. Pickle’s homepage. Press this link to have the homepage load in a new tab/window within your current internet application. Note: If you want to go directly to the company’s website and skip reading this guide simply click the “Apply” button near the top of this page. 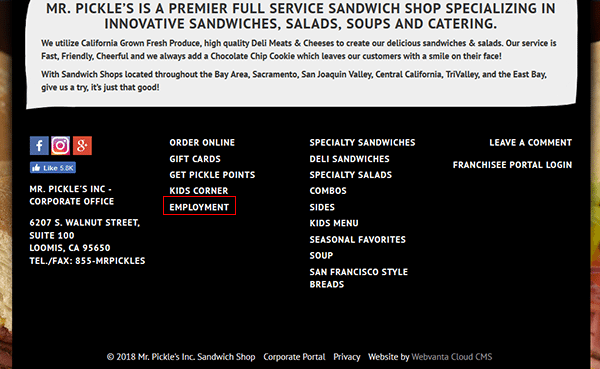 Step 2 – Scroll down the page and then hit the “Employment” link (as outlined in red in the below screenshot). Step 3 – Click the “Online Employment Application” button/link to open the company’s official online application form.